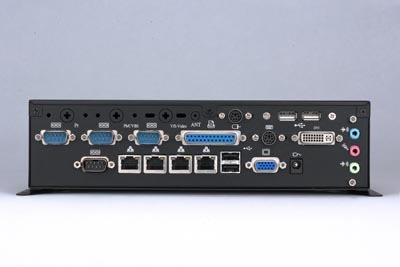 based on Intel® Core™ 2 Duo mobile, and offers the Intel PRO/1000 GbE and four Ethernet interfaces for industrial multiple Ethernet application, such as firewall, VPN and all-in-one server solution. The CMB-570E compact size, bootable CompactFlash socket also provide the suitable hardware solution for the small business / SOHO firewall / VPN market and all-in-one internet server application. In addition to the Core 2 Duo processor options, the CMB-570E is packed full of advanced features such as 4 x Gigabit LAN, up to 3GB of DDR2 RAM, 4 x USB 2.0 and simple 8 - 24V DC power input requirements, making the CMB-570E the perfect solution for almost any high-end embedded processing application. Key/Mouse , Line-In / Mic-In / Line-Out , 1 x Antenna , 1 x DVI .